I don't often talk about my work here on Cruft. While I find professional television and computer technology a fascinating career, many are more interested in my adventures in my kitchen instead. Here's a little tidbit to show you how my somewhat irreverant style surfaces in my professional life. One of the trade magazines I read is TV Technology, a fairly good source for news and opinions. 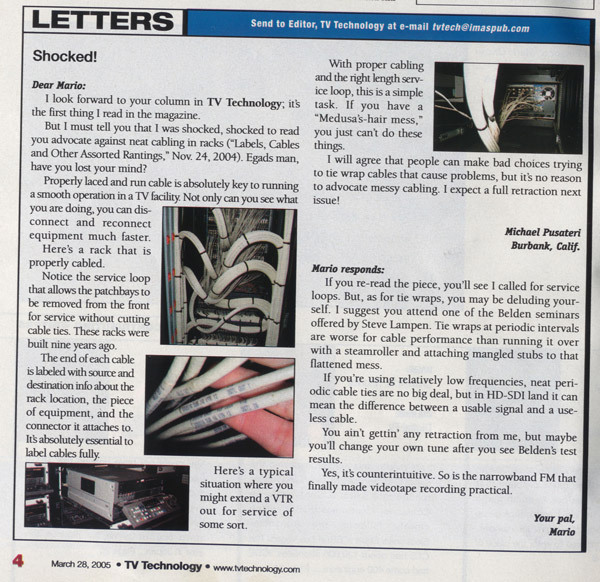 My favorite column is by The Masked Engineer, a TV engineer that hides behind a psuedonym while he/she writes about the FCC, industry players, and other TV trends in a humorous way. In a column last year, The Masked Engineer wrote about cabling in facility. His/her viewpoint was so far out of whack with reality that I was forced to reply. I sent in my rebuttal soon after and was suprised to find it in the current issue. Of course, the Masked Engineer and Belden are full of crap in their idea that reasonable tie-wraps can hurt the signal quality. Belden is the same company that once advocated running SDI video over Cat 5 cable. If anything would be bad for signal quality it woud be running CCIR 601 over unshielded cable designed for ethernet. We've had a fully SDI plant for ten years now, with tie wraps, and without any troubles with cabling. By far our biggest signal troubles are with RS-232/422 cabling long lengths and patchbay jack failure, neither of which have anything to do with tie wraps.